Wo findet man Berlin in Stockholm? I would recommend to visit the gallery Andersson/Sandström in Stockholm. Great work from Emma Hartman. Friday night, november 5th. I never thought I would have the amazing chance to see my musical highlight of the last 2 years live, here in sleepy Stockholm. Well i did, so thanks again Randy and Dean, for one hour of blasting pure power. Sverige toksatsar på modeveckan i Berlin. Sverige toksatsar på modeveckan i Berlin – Dagens Media. Sverige toksatsar på modeveckan i Berlin. Jo, det var dags att förstå att Stockholm ligger väääldigt “off” på EU-modekartan medan Berlin ligger så himla bra, som korsningen mellan nor- och sydeuropa, öst och väst… Iaf blir jag glad att läsa att svenska pengar fyller på Berlins kassan, de behöver det! Yes you read right. You SY fans, who travelled the world to see the exhibition Sensational Fix with your own eyes. So now you can start to build your own fan-gallery in your living room – if you can afford it. I mean if your living room is large enough – money doesn’t matter when it comes to gathering SY pieces of art. Anyhow, think hard about it. Ask for how many pieces were produced. 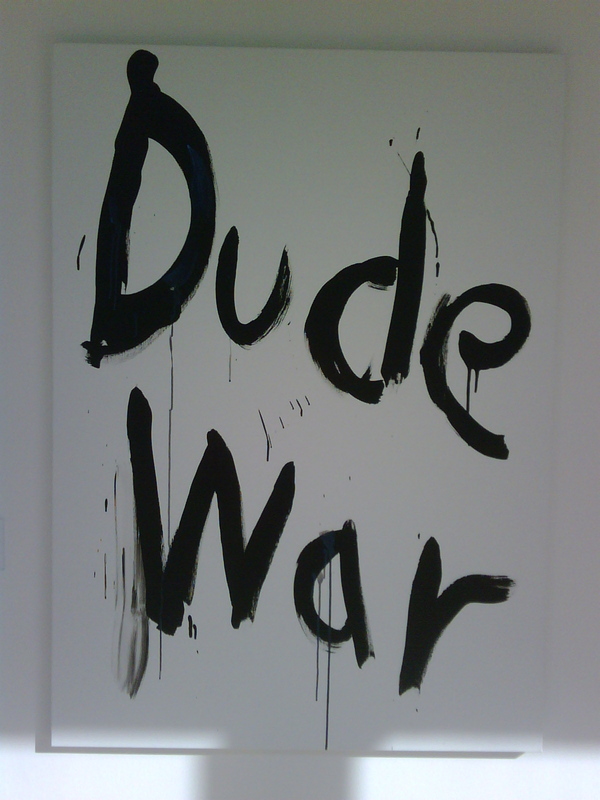 I already see that the “Dude War” exists in at least 2 exemplars, the one from Malmö and the one sold by Colette. So 4.000 EUR might be ok, but not if 50 other pieces are around. Personally i prefer the Malmö Dude War than the one at Colette. Here is the Malmös version. BTW: tonight, SY plays in Berlin. I really feel like i am at the wrong place. The museum exhibition SONIC YOUTH ETC. : SENSATIONAL FIX focuses on the multidisciplinary activities of Sonic Youth since the band’s formation in 1981. It features the band’s collaborations with visual artists, filmmakers, designers and musicians, as well as a choice of other works selected by the band. Through the multidisciplinary output of Sonic Youth and related works by other artists in the exhibition, an alternative history of contemporary culture is being uncovered in which the division between ‘high art’ and ‘low art’ is being called into question, while issues are explored such as teenage rebellion, adolescent wanderlust, gender, fame, fashion, sexuality, and religion. The exhibition is initiated and curated by freelance curator Roland Groenenboom in collaboration with the band and will be presented in Bolzano, Italy (from 10 October 2008 to 4 January 2009), and Kunsthalle Düsseldorf, Germany (31 January to 26 April 2009). Next up are The Museum of Malmö, Sweden (from May 29 to September 20 2009) and Centro Huarte de Arte Contemporaneo, Navarra/Nafarroa, Spain (October 2009 to January 2010). Further venues are currently in discussion, in Europe, the US and Asia. A complete description of the show can be found here. I am living in a socialist nightmare!! Let’s talk about music and concerts in Sweden. To summarize: Stockholm = No Future, that’s old news. Look at all these new swedish festivals: Right now the future seems to be in… hemmm, Hässleholm. Where is Hässleholm? I don’t know. Never heard this name before. Checked the website and the blog (Norra Skåne – Siestablogg) and it seems that it’s in Skåne, south of Sweden. The amazing thing is that Sonic Youth and Phoenix will be playing there. For Sonic Youth, it’s not such a big surprise, i know that Thurston Moore likes Sweden, remember the picture on SY’s website where Thurston is wearing a nice swedish midsummer Tee. Congrats to the Team organising the Siesta Festival, that’s a great start.